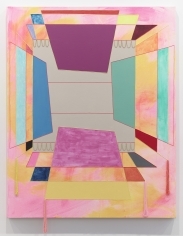 Galerie Lelong is pleased to present Sarah Cain’s first solo exhibition with the gallery. 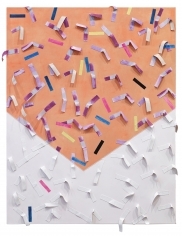 Featuring a new body of mixed-media works on canvas and a site-specific installation, Cain further expands her exploration of painting and space through her use of disparate materials ranging from beads, safety pins, Mylar balloons, paint rollers, and other found objects. 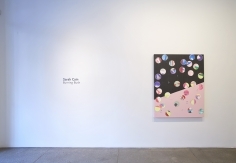 Cain’s spirited paintings recontextualize our understanding of traditionally perceived limits of painting, sculpture, and installation. 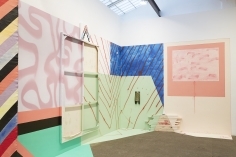 The site-specific work, her first such presentation in New York, will respond to the physical, psychic, and emotional space of the gallery as well as Cain’s time in New York. The creation of ephemeral, site-specific works recalls earlier work from Cain’s career in which she solely worked in abandoned buildings. 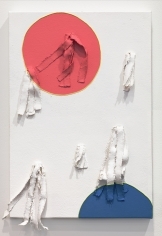 Today, the artist fluidly moves between works on site and her object-based studio practice. 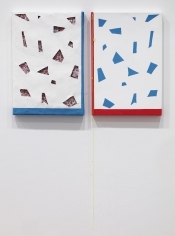 Cain will be present for the opening on February 7th from 6-8PM. 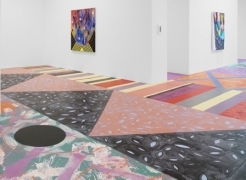 As Sarah Cain deconstructs and reconstructs her canvases, she reveals the physical structure of her work while working outside the confines of the canvas and breaking free from the limitations of the frame. 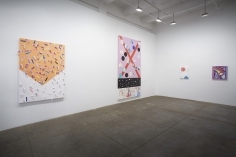 Though the diversity of her materials make each work unique, Cain’s practice is unified through her meditative, of-the-moment, and personal approach to transforming the individual experience into a universal poetry. 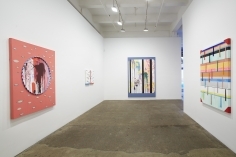 Direct and confrontational at times, Cain uses color and form to activate the space within and around the work, creating a body to canvas relationship between the maker and the viewer. Abstraction has always represented a space of freedom within Cain’s hands. 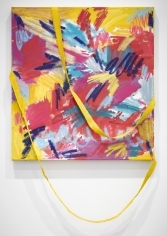 Similarly, words attached to her paintings become material in the same way that a found object melts into the paint. The show’s title, Burning Bush, is a continuation of Cain’s interest in the mystic. 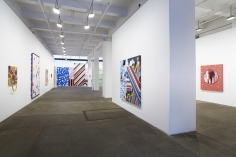 Cain has previously informed her practice from The United Society of Believers (the Shakers), tantric painting, and has created a large-scale installation in Marfa, Texas in a former Masonic lodge. Repurposing the words “Burning Bush,” Cain relates to its symbolism of the burning heart of purity, love, and clarity, as her painting practice is fundamentally about seeking truth. Like many of her chosen words, a double-sidedness to the phrase “Burning Bush” comically and consciously also embodies Cain’s feminist stance. 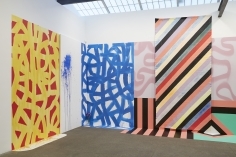 Sarah Cain was born in 1979 in Albany, New York. 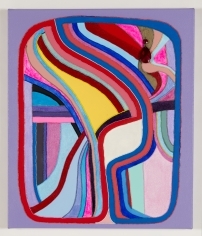 Her work has been included in exhibitions at the San Francisco Museum of Modern Art, San Francisco, CA; the deCordova Sculpture Park and Museum, Lincoln, MA; the Orange County Museum of Art, Newport Beach, CA; and the Imperial Belvedere Palace Museum, Vienna, Austria, among other national and international institutions. 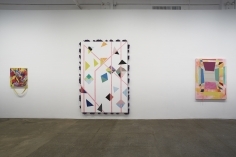 In 2013 her work was featured in LAND (Los Angeles Nomadic Division) in the exhibition “Painting in Place,” which surveyed conceptual abstraction. 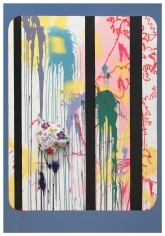 The artist lives and works in Los Angeles, California.